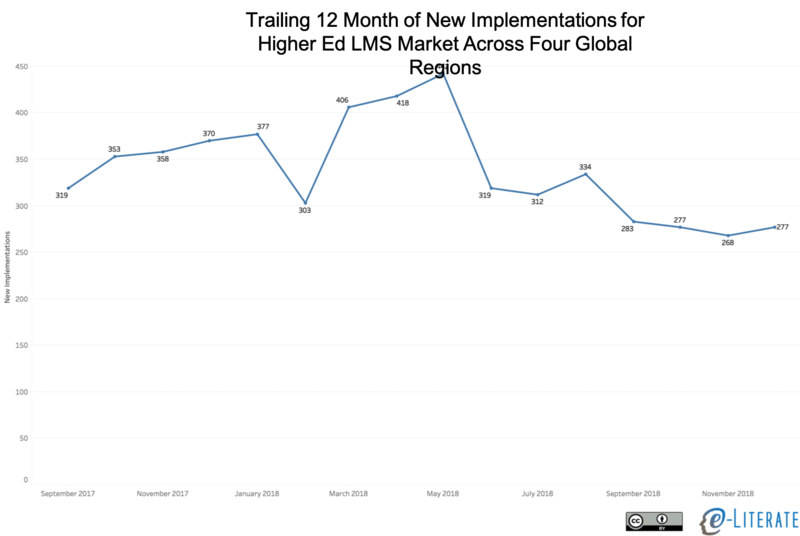 In one of our premium versions of the LMS Market Analysis services, targeted primarily at the investment community, we have noted since early summer (starting in June 2018) that the global LMS market appears to be slowing down for higher ed. Given our public market analysis role and given the trend now lasting more than half a year, this news seems more than just a note for investors. So for renewals what we've seen specifically this year is fewer large deals in the multi-hundred thousand dollar range than we've seen in previous years. It's a little still too early to talk about 2019, we'll be doing that in a few months but we have seen that and when I referenced earlier that it didn't look like we're going to grow domestic Canvas by much of it all, that's what I was really referring to, that's the key driver there. A recent analysis note from Brian Peterson at Raymond James shared similar observations. Our proprietary higher-ed North American LMS tracker pointed to a notable slowdown in large deal activity in 2018, with full year levels (as defined by the number of students) down in the double digits. But first a note about our data to help readers determine how to interpret the description of this trend. Along with new implementations (changes from one LMS to another at a particular institution), we also track what we call “First Seen” data. This captures how many LMS decisions we capture in a given month, and over time this metric acts as a leading indicator of implementation changes. This data is broken down by global region (North America, Europe, Latin America, and Australia / New Zealand are currently covered), LMS provider, and enrollment band (to capture institution size). What we noted in Summer 2018 was a fairly dramatic drop in First Seen data, particularly in North America. Over time, we also noted a change in Trailing 12 Month data from New Implementations (total of previous 12 months for each measured month to smooth out market seasonality). For Dec 2018 T12M data, capturing the full 2018 calendar year, the activity of new implementations is roughly 20 - 25% lower than it was a year prior. Even with T12M data smoothing, the trends are still somewhat lumpy, which is the nature of academic markets. The market for implementations seems to have peaked at the end of the spring 2018 academic calendar and then dropped to current levels that represent a plateau rather than ongoing downward trend. To allow reasonable comparisons over time, the data above represents T12M as we knew it at the time. The data is not a full set, as it does not contain implementations we discovered more than a month after the reported month, so the key is to look at trends and not absolute levels. There are other factors to consider that impact company finances, such as the ongoing enrollment declines in North America, particularly among for-profit or formerly for-profit institutions, but we now have two different variables both pointing to at least a temporary dropping of activity. It’s premature to determine whether the slowdown will continue or whether market activity will rise again in 2019. We have some statistical and anecdotal indicators for both cases but are not ready to predict yet. Hopefully this data description of market activity hasn’t been too tedious, but there are strong arguments that company financial health in 2018 / 19 for the providers will continue to have an outsized impact on the future of LMS offerings.